Solus Scientific was formed in 2009 and has since established itself as a leading supplier of pathogen tests and automated testing equipment for the food industry. The Solus Raw Meat Flow Through Test (RMFT) is quick and simple, taking just 12 minutes to complete. Perfect for on site testing, the test can be used for raw materials and finished product testing. 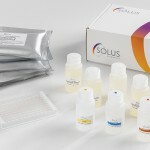 Solus Pathogen Testing Solutions offer food testing laboratories an easy to use, cost effective and efficient method for the detection of Salmonella, Listeria and E. coli O157 in food and environmental samples. Ngaio Diagnostics is a privately owned laboratory supply company based in Nelson, New Zealand. Established in 1991, we specialise in the distribution and support of quality diagnostic products to hospital laboratories, community clinical laboratories, veterinary laboratories, food testing and environmental laboratories. Visit the Ngaio Diagnostics Facebook page. Copyright 2019 Ngaio Diagnostics. All rights reserved.